Domain Validated (DV): Inexpensive and very quick to get issued. For those looking for encryption, this protection is recommended for internal use, personal & hobby sites and small forums that have logins, forms or other non-transactional data. DV certs really shouldn’t be used for commercial purposes. Validation is done only through the domain’s Whois record. Will display a padlock and HTTPS. Organisation Validated (OV): Affordable protection for small businesses to display trust. Recommended for small to mid-sized business sites where validation of the company is important. Can be used for sites with low-volume eCommerce transactions. Will display a padlock and HTTPS. Validation takes a few days and the organisation is strictly authenticated by the personnel of the Certification Authority [CA] to confirm legitimate business information [using business listings such as Dun & Bradstreet]. • For help generating a CSR [certificate signing request] on your server, please visit this GeoTrust page. • For GeoTrust videos on generating a CSR and reissuing & installing certificates on various servers, please visit GeoTrust’s YouTube page. • To reissue either a GeoTrust or RapidSSL certificate, please visit the Reissuance Page. • For instructions on changing from SHA1 to SHA2, please visit here. As per new GDPR requirements and the new policy of private whois records, the generic e-mail address will now be used for validation of a certificate. This e-mail address is based on the domain you purchased the certificate for. All new certificates are automatically logged and Certificate Transparent [CT] compliant – this is to comply with Google Chrome and Apple’s new CT policy. **SAN support is not currently offered on any SSL Certificate types. We will be adding SANs shortly. As of 20 February 2018, all certificates can only be purchased up to maximum of 2 years. Current certificates under a 3 year term are not affected. Sectigo SSL certificates are an affordable and easy way to secure an internal server, a hobby website or small forum. High encryption levels and hassle free validation. Sectigo SSL includes a $10,000 warranty. Sectigo SSL are available starting at $85.95 per year. Maximum of 2 years. Sectigo SSL certificates are an affordable certificate that is business validated. High encryption levels for a small to mid size business. Sectigo SSL includes a $250,000 warranty. Sectigo SSL are available starting at $95.95 per year. Maximum of 2 years. Sectigo Premium SSL Wildcard certificates are an affordable certificate that is business validated. High encryption levels for a small to mid size business that covers the domain and unlimited subdomains. Sectigo Premium SSL Wildcard includes a $250,000 warranty. Sectigo SSL are available starting at $425.95 per year. Maximum of 2 years. Sectigo EV SSL certificates are an affordable certificate that is issued through Extended Validation. High encryption levels provide trust for a mid level to Enterprise size business. Boosted consumer confidence with the Green Address Bar. Sectigo EV SSL includes a $1,750,000 warranty. Sectigo SSL are available starting at $195.95 per year. Maximum of 2 years. Thawte SSL123 are available starting at $70 per year. Maximum of 2 years. Thawte Wildcard certificates are an affordable certificate that is business validated – secures unlimited subdomains under the one certificate. High encryption levels for a small to mid size business. Thawte Wildcard includes a $1,250,000 warranty. 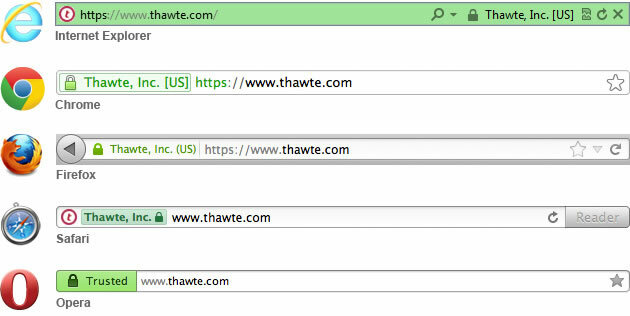 Thawte SSL Webserver EV certificates are issued via Extended Validation. Best for credit card transacting websites, banks and financial institutions as the certificate includes the confidence displaying Green Address Bar in browsers along with Thawte’s Trusted Site Seal. Thawte SSL Webserver EV includes a $1,500,000 warranty. Symantec Secure Site Pro EV certificates are issued via Extended Validation which gives your customers proof that they can confidently transact with you. These certificates are highly recommended for e-commerce transactional websites as the certificate includes the confidence displaying Green Address Bar. On top of that, there’s the well respected dynamic Norton Site Seal and daily vulnerability & malware scanning. Symantec Secure Site Pro EV includes a $1,750,000 warranty. RapidSSL Certificates are available starting at $24.95 per year. Maximum of 2 years. RapidSSL Certificates are available starting at $159.95 per year. Maximum of 2 years. QuickSSL is a low cost alternative for providing your customers with a “lock” on their browser to provide peace of mind when transmitting data. For corporate customers, they are ideal for use in internal environments to protect mail servers, routers, switches, and Intranets. It offers the strongest real-time authentication process on the market today using the ChoicePoint Unique Identifier, GeoTrust’s industry-recognised domain control authentication and two-factor telephony authentication. Includes a $100,000 warranty against mis-issuance. QuickSSL Certificates are available starting at $99 per year. Maximum of 2 years. The QuickSSL Premium certificate combines the functionality of the QuickSSL certificate with a GeoTrust smart seal – all provisioned within a few hours. The high visibility seal, containing the live date and time stamp, assures your customers that their credit card and other information will not be viewed, intercepted or altered. This makes it ideal for corporate and e-commerce web sites. Includes a $500,000 warranty. QuickSSL Premium offers the strongest real-time authentication process on the market today using the ChoicePoint Unique Identifier, GeoTrust’s industry-recognised domain control authentication and two-factor telephony authentication. True BusinessID brings the patented “Smart Seal” technology to your web pages. Your customers can immediately identify your site as genuine, authentic, and validated by an independent third party. When your customer clicks on the True Site “Smart Seal”, the server automatically checks the domain name and relevant information about your company is presented – assuring your legitimacy. This promoted greater customer confidence resulting in more e-commerce activity and a significant increase in online revenue. Includes a $1,250,000 warranty. True BusinessID Wildcard brings the patented “Smart Seal” technology to your web pages. Your customers can immediately identify your site as genuine, authentic, and validated by an independent third party. When your customer clicks on the True Site “Smart Seal”, the server automatically checks the domain name and relevant information about your company is presented – assuring your legitimacy. This promotes greater customer confidence resulting in more e-commerce activity and a significant increase in online revenue. Includes a $1,250,000 warranty. Our True BusinessID certificates easy to install and renew. True BusinessID certificates are available starting at $475USD per year. Maximum of 2 years.